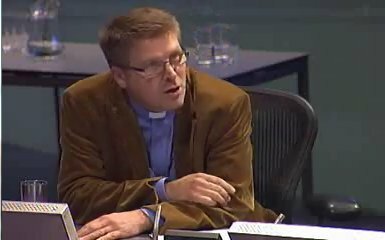 Reverend Andy Rider, a former vicar at All Souls Clubhouse, spoke in support of Exemplar's plans. A former vicar of the All Souls Clubhouse in Fitzrovia spoke in favour of the demolition and redevelopment of the Fruit and Wool Exchange building in Spitalfields at a public hearing in front of the Mayor of London last night. The plans by Exemplar were approved by Boris Johnson at a meeting despite strong local opposition to the redevelopment, and which overturned the decision taken earlier in the year by Tower Hamlets council. Exemplar’s plans, which include demolishing the Fruit and Wool Exchange leaving one facade and obliterating a seventeenth-century street, were strongly opposed by Dan Cruickshank, Peter Boisseau, Charles Gledhill and Paul Johnston on behalf of The Spitalfields Trust and The Spitalfields Community Group. The reverend Andy Rider introduced himself by stating “I am the rector of Christ Church Spitalfields and soon to be area dean of Tower Hamlets.” He said he was a trustee of the Grade I listed Christ Church Spitalfields and went on to say that although he was also a member or The Spitalfields Community Group he held a different view and “welcomed this development proposal for a number of reasons”. Reverend Rider had served for ten years as a vicar at All Souls Clubhouse in Cleveland Street until 2003 when he moved to Christ Church Spitalfields. The Mayor Boris Johnson also referred to reverend Rider’s submission as part of the reasons for allowing the development to go ahead. The meeting was webcast and can be viewed here. I am supportive of the plans to redevelop the LFWE site which overlooks our church and gardens. I have requested that our crypt and gardens be considered for improvement as potential planning obligations. Consideration should also be given to compensation in view of the considerable impact on the church by way of dust, noise and dirt during construction. Replacement trees long Brushfield Street should improve the vista of Christ Church Spitalfields (page 25). A campaign continues to try to Save the Fruit and Wool Exchange and an application has been made to list it. Exemplar are currently carrying out a development called Fitzroy Place on the former Middlesex Hospital site in Fitzrovia which they received planning permission for from Westminster Council earlier this year. The development was strongly opposed by local people and parents of All Souls School also wrote objecting to the plans. Boris Johnson also overturned a decision by Camden Council last year an action that was strongly criticised by local people and Sue Vincent deputy leader of Camden Council. Thank you to Fitzrovia News for this – Reverend Andy Rider should have declared at the Mayoral Hearing on the London Fruit and Wool Exchange, that he will benefit from this Exemplar development. It is surely a prejudicial interest that the Reverend should have owned up to in his speech – and not left unmentioned and buried in the Report. Thanks to FN for finding this in the Report and publishing it here. Planning obligations or s106 monies have tainted Exemplar’s development in Spitalfields since the beginning, to the point where our heritage has now effectively been sold to Exemplar. If it is not those s106 “benefits”, it is the promise of City traders spending money in next door restaurants – or even on Brick Lane – that has got Exemplar their ‘supporters’. Thanks to Fitzrovia News for reporting on our unfortunate shared connection to Reverend Rider and also to Exemplar. He has only been here since 2003. It is truly shameful what he and the other two Speakers and supporters for Exemplar’s development, have done to heritage in Tower Hamlets. We who didn’t and couldn’t speak, now hope SAVE Britain’s Heritage’s application to English Heritage to list the Exchange, will save this building. Hope we can still count on your support as Exemplar have subsequently announced that they will be starting work in November (internal stripping of the 1929 Exchange, before demolition?) They heard at the Hearing that SAVE were asking for a halt while the Listing application went ahead, so they respond with this. We local residents in Tower Hamlets know exactly how you must feel there in Fitzrovia.